Share the post "The Layout Manager"
The Layout Managers are classes responsible of how the components will be placed inside the container. There are different types of layout managers. In this tutorial, we will only discuss some of the most commonly used layout managers, the flow layout, border layout, grid layout, card layout and grid bag layout. This is the default layout manager. Flow layout, layout its component based on the order when they are added to the container. It starts from top to bottom, left to right. For example, if i have 3 JButtons, and add first the button1, button2 and lastly the button3, the first that will be added and layout will be button and it will be on the top left of the container. If there is still enough room for button2, then button2 will be added also on top portion, else, it will be below button1. We have used flow layout manager from the last tutorial. Lets take another example here. 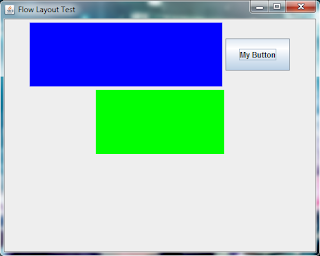 Flowlayout add its component based on the order of how they are added. First, we have added pane1, so it will be in the top left of our frame. Next, we have added our button. Since there is still enough room or width that was left when we added our first panel, our button will be placed on the top, next on the panel. Lastly, we have added our pane2. Our pane2 has a width of 200 and our frame has only 500 in width and we have already consume 400 of its width when we place our pane1(300 in width) and our button(100 in width), and what is left is only 100 in width which is not enough for our pane2. Therefore pane2 will be added on the next level, below our pane1.